Smart Phones development is going amazingly and mobile developers release so many mobile applications daily. Mobile apps getting good reach because apps make the users to a great usability of devices. If you are having a smart phone or a tablet, you need to search the apps in Google. Search engines display all results of the links that contains with your searched apps. There are so many mobile devices like Android, iPhone, Nokia and so on. You have to find out properly what app you want to download and it would be taken your little time. Otherwise some peoples go official sites of their mobile devices. Google optimizes its search options for the latest mobile trending. Google made one separate option as “Application” especially for mobile and tablet applications. With this option you can search mobile applications and all other mobile softwares only in one place. So you can download your mobile apps quickly. If your mobile is Android or iPhone or Nokia, whatever you can get the mobile apps quickly. 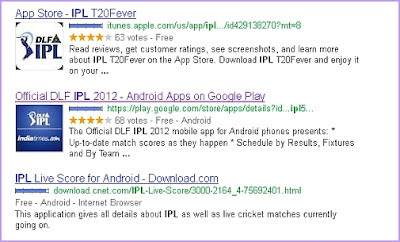 How to Search Mobile Apps in Google? Finally you can set only Android apps to display in search results or set to your device specific only results. In the left side panel you will see the above list of sites that contains only for specific devices. Choose anyone to search mobile applications for your particular mobile device. This option more helps you to find out the apps appropriate to your phone.